The Best of British board game is a light hearted and entertaining trivia game. The theme of ‘Britishness’ is quite interesting, and there is a wide variety of questions featured within the game, and with 2400 questions the game offers good repeat play value. The gameplay is simple and along similiar lines to many other trivia games, so there is no real learning curve in terms of understanding how it plays…although we did have to double check the rules on which colour questions to ask when a couple of times this wasn’t too arduous when compared with trying to understand the rules of some more complicated games. Gameplay length was fine – we played the game through with 3 teams in around 45 minutes, which seems to fit the play occasion i.e. after dinner game or family game at Christmas. The questions are set at a level that most people can play at i.e. not too intellectual or overly geeky! If we had one minor comment to make about the game, quite a few of the questions date specifically to around 2011 to 2012, which wasn’t really a problem but did test the memory a little for some of our players! WHO’S IT FOR: Best of British is most suited to adults for after dinner party for those not looking for a weighty intellectual challenge. Obviously being British will help players to answer more questions…! THE TOY VERDICT: The Best Of British Board Game is an enjoyable trivia game. 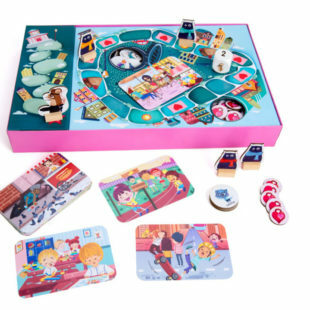 It’s a dependable game you can bring out after dinner with friends or at family get togethers, knowing that it will be fun to play for most people and will facilitate social interaction effectively.